The Thirteenth Hole is a slight dog leg left. Pretty safe to hit driver off the tee on this hole, you will want to stay as tight to the left tree line to avoid driving through the fairway on the right beyond the dog leg. 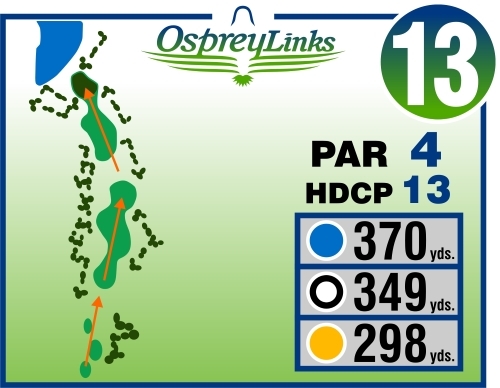 A well struck drive will get you to the hundred yard marker or beyond, but as you approach your ball be sure to check out where the pin is because the closer to the elevate green, the more difficult it is to determine pin location. But regardless of your drive, pay attention to the bunkers on both the left and right that protect the green.